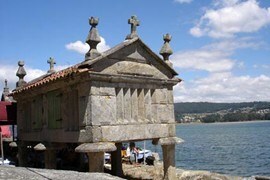 There are many pilgrim paths to Santiago but none is more soulful or significant than the Portuguese Way. Tui to Santiago: 6 nights accommodation (1 night ** with dinner, 3 nights ** with breakfast only, 2 nights *** with breakfast only), 1 x dinner, 6 x breakfast, luggage transport, route notes/maps, transfer on day 2. Extra nights available. Meals not mentioned above, flights and travel insurance. This self-guided walking holiday is available all year except Christmas and New Year and commence on any day to suit personal travel arrangements. Arrival in the historic town of Tui on the Spanish/Portuguese border. Day 2: Porrino – Redondela/ArcadeTransfer to Porrino. Porrino to Redondela or Arcade, mostly along quiet countryroads and along woodland paths, following the beautiful Louro river valley.14.2 kms/9 miles or 21.7 kms/13.5 miles. Overnight Redondela or Arcade. Day 3: Redondela/Arcade – PontevedraRedondela or Arcade to Pontevedra. Climb through mixed forest before going down to the sea at Arcade and then a second uphill stretch following ancient stone paths before dropping down to the provincial capital at Pontevedra.19.7 kms/12.3 miles (from Redondela) or 12.2 kms/7.6 miles (from Arcade). Overnight Pontevedra. Most of this stage is through countryside and woodland along gentle river valleys with almost no climbing.23.8 kms/14.9 miles. Overnight Caldas de Reis. A beautiful walk, with one short climb, through the Bermana river valley and then down to the Valga Valley to where St. James arrived in Iberia.19.2 kms/12 miles. Overnight Padron. The final day takes us through pine, eucalyptus and oak woods before climbing up to Santiago de Compostela.25.6 kms/16 miles. Overnight Santiago.